Writing well is not only an academic requirement, but a way to organize your thoughts, document your days, feelings and opinions, communicate with others, exercise your imagination and expression, and to create. If your child could use a bit of a push to become a better writer and reap some of the benefits that come with it, put the following tips to good use. First and foremost, you should realize that your child looks up to you and molds their behavior accordingly. To motivate them to write, lead by example. You could even write with your child every afternoon, so you can both have a more enjoyable time doing it. Stress, frustration, intimidation, and confusion, are all negative feelings that your child shouldn't associate with writing. To prevent that, keep a relaxed attitude towards it, and avoid pressuring them to write or punishing them if they make mistakes. Writing can come naturally when you're inspired to do it. To find inspiration, you and your child could swap stories, create stories of your own, experience new things, share feelings and opinions, and read more, so they're eager to write. Finally, but just as important, you need to be supportive of your child during their writing ventures. Be sure to always read their material (if they share it with you), and to correct their mistakes respectfully if you find any. 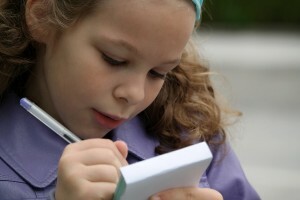 If they need a boost, give it to them, so they feel confident to continue writing. The Tutoring Center, Navarre FL and their "Geniuses in Training" Writing Program will empower your child, help them clear any doubts, and guide them so they can master their writing skills. Call 850-939-5384 for more information on writing tutoring in Navarre FL, or to request a free consultation.